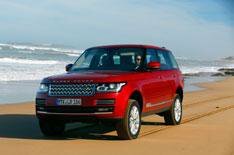 2013 Range Rover preview | What Car? Land Rover's all-new Range Rover will arrive in UK showrooms in January 2013, but we're giving you the chance to see it much sooner than that. We've got five places up for grabs at an exclusive preview of the premium 4x4, taking place in Warwickshire on Friday, December 7. If you want to see for yourself whether the new Range Rover lives up to its reputation as the worlds best SUV, we want to hear from you.